Someone e-mailed me recently, asking a lot of questions about how one goes about becoming a Mangaka. I am not a professor of the subject, but I have picked up a lot from freetalks of various Mangaka I have read. (Especially from Sakura Momoko). Hello guys! 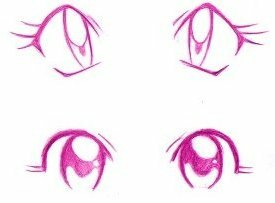 Here's a new tutorial "learning-by-example" on different manga eye styles. I think it's a good idea to print out and practice by copying, until you get used to the general patterns: where to place lights in pupils, where to shade, gradients, eyelashes.... Let me know your opinion via comments! The first tutorial on drawing materials. Pencils seem so ordinary that you might not have thought about them very much? Have you??? Hey have you ever wanted to draw the cute chibi characters? Then you now have the beginners' guide to SD characters!